Emeryville's longstanding progressive resident advocacy group Residents United for a Livable Emeryville today announced their endorsement of Sarah Nguyen, Susan Donaldson and Brynnda Collins for Emery School Board in the November 6th election. With the School Board endorsement, RULE now fills out their picks for Emeryville for the 2018 campaign season having endorsed Dianne Martinez and Scott Donahue for City Council earlier. The three School Board candidates have also garnered the endorsement of the Democratic Party of Alameda County as well as the entire Emeryville City Council. Ms Collins , the only incumbent of the three, is currently president of the Emery School Board having been selected by the Board in 2017 to fill in for a vacating member. The three School Board candidates are not running as an official slate but campaign watchers have noted they appear to be collegial among themselves and have been appearing together at campaign events in town. RULE vetted and selected the candidates in an interview process conducted at their posted meeting on Saturday. 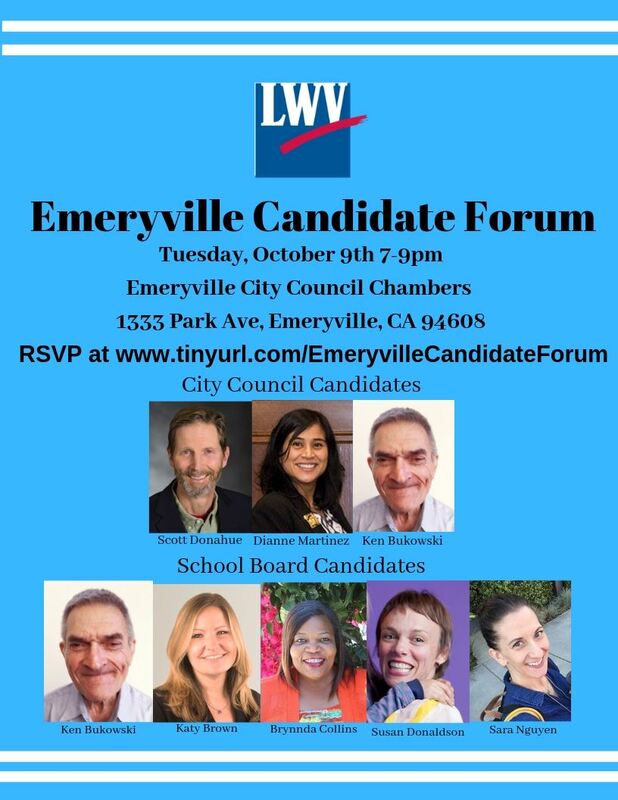 Join the League of Women Voters of Berkeley, Albany, Emeryville for the Emeryville City Council and School Board Candidate Forum. All candidates, candidate supporters, and audience members must follow the League of Women Voter’s ground rules (see below). There will be opening and closing statements, prepared questions, and questions from the audience. Audience questions will be submitted in writing throughout the forum and will be reviewed for repetition and relevancy before being given to the moderator. The forum will be recorded and uploaded to our website and YouTube. The League of Women Voters is a non-partisan political organization that encourages informed and active participation in government and influences public policy through education and advocacy. The League never supports or opposes candidates for elective office or political parties, but sometimes takes positions on ballot measures. Please join us 10 am Saturday, Sept. 29 and meet candidates running for the Emeryville Unified School Board. All five candidates (running for three seats) will make presentations and take questions from the community. This is your opportunity to meet the candidates and share your concerns. This is a particularly important election, as our school district struggles to increase enrollment and test scores, and retain and support good teachers. Please join us, and spread the word! All are welcome! Each candidate will be allotted 20 minutes. The candidates and their time slots are listed below.